Being 12000 BTU rated and designed to fit in windows. 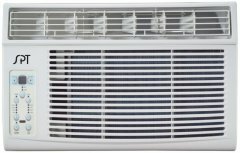 Considering this 12000 BTU window air conditioner's aggregate ranking of 85%, we believe that the Frigidaire FFRA1222U1 is currently Alphachooser's best 12000 BTU window air conditioner 2019. Furthermore, we think that our sample of 66 reviews from our sources gives us a high confidence level (more on confidence levels) that justifies labelling it a "no-brainer best choice." The Koldfront WAC12001W appears to have managed being a 12000 BTU window AC that is also reasonably-quiet, seeing the number of times that it has been praised on reviews for this said feat. Many reviewers also seem to have thought of it as a well-engineered model with thoughtful features. Used both in wall- and window-mounted setups, this reportedly handles both its cooling and heating functions adequately. Buyers also appreciate that it already comes with window-mounting equipment. This 12000 BTU air conditioner has an energy efficiency ratio of 10.9, which is a rather-average spec (if this is an important facet for you, we have a list of the best energy-efficient air conditioners on AlphaChooser that you can check out). However, although the 99-dollar Energy Star annual cost figure affixed to this unit may be slightly-unsettling for those who are conscious about their electricity bills, most consumers have reported feeling that the price they pay to power this unit is within the bounds of what is (Q))reasonable." One pleased customer has said that he's used this AC to cool an entire two-bedroom unit, and that it does the job without burning a lot of power . Most of the complaints we've seen for this air conditioner seem to be about remotes that were either not functioning or whose battery slots didn't close properly. Note, however, that these make up a very small portion of its 112 total customer reviews, and that it doesn't have anything to do with this AC's cooling ability. Also, this is a 220V unit, so expect having to work on wiring to accommodate it. At this point, it's safe to say that this AC has left most of its customers pleased, which makes its 4-star rating and position as Alphachooser's second best 12000 BTU window air conditioner 2019 not surprising at all. Most reviewers of the LG LW1216HR window-mounted air conditioner (it has 145 total reviews so far) have nothing but praises for how this fellow performs. Many say that it cools well and that it remains quiet while doing so. With a relatively-high energy efficiency ratio of 11.3, it has been associated with other energy-efficient air conditioners here on AlphaChooser. One reviewer even said that this LG AC cut her summer electric bill in half . 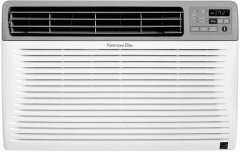 Technology-challenged users will find it nice to know that many reviewers have noted that this 12000 BTU window air conditioner is very easy to operate with its remote control. It works quickly as a heater, with some reviewers reporting reaching "toasty warm" levels within a few minutes. While its ratings aren't perfect, the portion that consists of negative reviews is minuscule compared to the approving majority. Looking at them, it seems like most of the dissatisfaction stems from inefficiencies in shipping that has unfortunately caused damages on a small number of ACs. 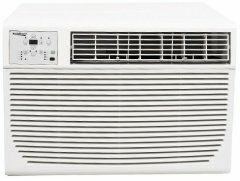 Only one negative review appeared to have something to do with the product itself (as of now, at least), with the said review expressing dislike that this energy-efficient 12000 BTU window air conditioner didn't come with a standard plug, which should be easily resolved by purchasing an adapter. Due mainly to the fact that an overwhelming majority of people found this air conditioner almost faultless, our review-aggregating algorithm has determined that it is an Alphachooser good choice. This is after sorting through a whopping 2660 reviews for all 12000 BTU window air conditioners. A 12000 BTU window air conditioner that promises to cool rooms of around 450-550 square feet, the SPT WA-1211S touts an average star rating of 4 stars. By the way, a version updated with a better air flow, a higher energy efficiency rating (and better reviews at the time of this write up), known as the WA-1222S is also featured here at AlphaChooser. Probably as a result of its high BTU rating, the WA-1211S is best known for its cooling performance, with one user saying that it puts out some serious cold air, while another one says that it blasts some ice-cold air while being very quiet, which is not something that's usually said of a 12000-BTU unit. Another one of the WA-1211S's satisfied customers even tried to use it to cool a 900-square-feet room with a 15-foot ceiling, which is an extreme stretch, going back to its aforementioned on-paper cooling coverage. Nevertheless, that user was pretty impressed with this window-mounted AC unit's performance . A few other features that reviewers appreciate include this Sunpentown model's full-function remote control, adjustable vents (a rather typical facet among standard window ACs), and washable filter, the latter coming with an alert system that reminds users when it actually needs some cleaning. Some negative reviews given to the SPT WA-1211S involve units that broke down after just a couple of months. One user also noticed some rust buildup near the bottom after a couple of years, attributing it to the quality of its metal housing, however, since only 6 percent of its 588 reviews were 1-star ratings as we were writing this, this problem is obviously not a common one. A few other users say that it cools nicely, but is far too loud to deal with -- then again, some happy buyers say otherwise, not to mention that our tolerances for appliance noise varies. Anyhow, our review-crawling system, which aggregated 2660 reviews for 12000-BTU air conditioners across various sources, concludes that the SPT WA-1211S is an Alphachooser good choice, making it one of the top 9 12000-BTU ACs you can get your hands on. 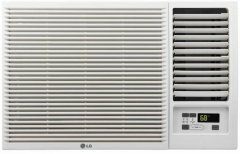 The LW1216ER from LG is a 12000 BTU window AC that's gathered praises for being "surprisingly quiet" (but with its 52dBA max noise rating, this really isn't surprising for us here at AlphaChooser). Our review crawler has so far gone through 801 reviews for this window-mounted air conditioner and found that it has gotten a combined rating of 4 stars. While it's generally known that newer air conditioners are much more efficient than their predecessors, this particular LG model takes it to another level with an energy efficiency ratio of 12.1, which is just 0.2 shy of the highest value we've seen across all air conditioners. 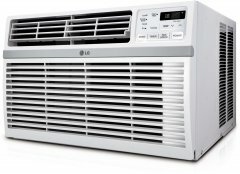 It's probably due to this highly-competitive energy efficiency aspect that some customers who've bought one unit have chosen to buy more to replace all the air conditioners in their respective homes, seeing that the cost of the LG LW1216ER "saves more money over the cost to operate an older model" . Some people didn't seem to like the fact that this 12000 BTU window energy-efficient air conditioner defaults to the energy saver mode every time it's switched on, but this very same fact was also a pro for other consumers. Also, this AC apparently isn't the easiest to install, mainly due to the product's weight and the diagrams on the manual being a bit too small. As such, solo homeowners should expect needing company when setting up this AC -- or you can go the other route suggested by many buyers and get Amazon's installation services for yourself. 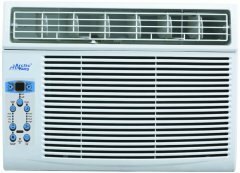 This energy-efficient air conditioner is an Alphachooser good choice, according to our algorithm that has scanned through a total of 2660 reviews for all the models in the 12000 BTU window AC sub-category. The SPT WA-1222S is a window-mounted air conditioner whose high 12000 BTU capacity translates to a cooling coverage of 450-550 square feet. It comes with three fan speeds and typical operating modes, such as Dry, Sleep, and Energy Saver. Speaking of energy-saving, while its appreciably-high (relative to its BTU rating) 11.3 EER (Energy Efficiency Ratio) suggests that it's a rather power-efficient unit, to which some reviewers attest, its 96-dollar annual cost suggests otherwise, since a few other 12000-BTU ACs featured here at AlphaChooser don't even reach the 90-dollar mark. In any case, users loved this Sunpentown model for its cooling performance alone, with one enthusiastic reviewer saying that it puts out so much cool air that it manages to cool not just the bedroom, but the adjacent living room as well . Another user says that the WA-1222S, which, by the way, has an average user rating of 4 stars, cools an entire railroad-style one-bedroom apartment with easily. Several other reviewers (It had a total of 276 reviews under its belt as we were writing this) who were very pleased reported that it cools amazingly well. With that said, one user cautioned that its operational buzz sounds like rushing air, so installing it on a nearby window from where you usually sit might not be a very good idea -- noise and BTU rating are somewhat positively correlated. One disgruntled user mentioned that they purchased four units of this 12000 BTU window air conditioner, with three of them failing within just 1-2 years, while another noticed some dark mold buildup near the bottom after only five months of usage, but those comments don't really take anything away from its apparently powerful cooling capability. So, after sending out our review-crawling algorithm to analyze 2660 reviews for 12000-BTU window AC units from various sources, we can confidently say that the SPT WA-1222S is one of the top 9 12000-BTU units available, particularly, an Alphachooser good choice. 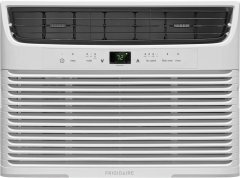 The 4-star Friedrich CP12G10B is a high-capacity 12000 BTU window air conditioner that's built for large bedrooms and home spaces of up to 550 square feet. It has several siblings listed here at AlphaChooser, one of which has only half its BTU rating, obviously catering to smaller areas. As far as user reviews go (It currently has 567 reviews under its belt), the CP12G10B is best known for its build quality, with a couple of delighted buyers describing it as sturdy and well-built. Some also praise its clean, modern look, saying that it does not look as clunky as many other 12000-BTU AC units on the market . Another thing that many users liked is its energy efficiency, boasting a desirably-high -- especially coming from an AC unit with its BTU capacity -- Energy Efficiency Ratio of 12.1. Consequently, it only costs 89 dollars annually to operate, whereas several of its rivals cost somewhere around the high 90s. Additionally, it comes with a remote control and a thermostat that, according to one user, is dead on. While users generally agree that its cooling performance is satisfactory, noise is a different issue. A couple of users who gave it 1-star ratings (Only 15 percent of its total review count were 1-star rants as of this write-up) liken its operational buzz to that of a tractor or a helicopter, while the majority of others say that it's one of the quietest 12000 BTU ACs they've ever come across. 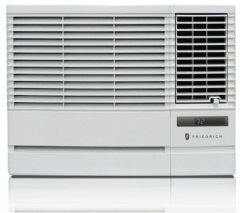 Summing up, according to our shopping algorithm, which examined 2660 reviews for ACs rated at 12000 BTU, concludes with certainty that the Friedrich CP12G10B is an Alphachooser interesting choice and is evidently one of the top 9 12000-BTU air conditioners on the market today.